Ameno World Azrene Soraya Buktikan Sangkaan Orang Ramai Tentang Sikap Buruk Rosmah Mansur. Luahan Anak Rosmah Luahan Anak Rosmah, Azrene Soraya Buktikan Sangkaan Orang Ramai Tentang Sikap Buruk Rosmah Mansur. Luahan Anak Rosmah, Azrene Soraya Buktikan Sangkaan Orang Ramai Tentang Sikap Buruk Rosmah Mansur. Aku tak kata apa-apa ya. Aku cuma baca apa yang diluahkan oleh anak perempuan Rosmah yang bernama Azrene Soraya Abdul Aziz. Azrene ialah anak perempuan Rosmah bersama bekas suami pertamanya. Selain Azrene, Riza juga merupakan anak dari hasil perkahwinan pertama Rosmah Mansur. Rosmah Mansur dan Najib Razak berkahwin kali kedua selepas bercerai dengan pasangan masing-masing..
One day a boy slept, someone came knocking at his door. He opened it a tad bit and a voice called out from the great outdoors. But his traitorous heart heard what was laid out by the door and it rocked him to the core. It was all he had ever wanted and so much more . His hand reached out and he let it in and that was the end of his solace. Because he took the offering laid at his door. One day a little girl slept and a knock pounded on the door. A voice asked if there was anything in the world she wanted more. She answered peace, justice and all things right. For her children to sleep safe at night. She reached out and let it in, widening the door but never shutting it tight. Both got what they wanted, but paid so much more. You get what is yours and not a penny more. Riza was and still is someone we all love very much. Unfortunately, our love was not enough for him and those he chose to surround himself with. He chose, like many others before him, to have fame, wealth and adulation. He is now paying the price for it. If Malaysia is not willing to give the justice that the Malaysian people have prayed for and the justice my family have each night prayed for then the US has- in its own way that only they can justify. Those who know me know that i am the black sheep of the family- but that does not mean i do not love my family. People can call me heartless for what i write today but i have always stood for and done what is right, for truth and for justice even if there is a high price to pay and if it means doing the unpopular thing. I have always maintained that if Riza did indeed use and profit from stolen funds he needs to pay for what he has done. If he stood as proxy or as a trustee for what does not belong to him or any individual who asked him to be the "dutiful son", he needs to pay for it. Nevermind the reasons justified for doing it, if it hurts the country and the people then it is wrong. A wrong must be righted. I am not a politician and i hope never to have anything to do with politics. If the USAG and the US have decided to cop out by leaving the term "corrupt government officials and 1MDB officials" as an open ended thing, i hope and pray for the sake of this country and what is right that the right individuals be brought to justice. To his mother, you have forsaken one child at great cost and detriment. You have utilised and mobilised government resources to wreak terror to harass us over the last ten years for standing up for what we believe to be right. Please do not forsake another just so that you and your husband can get off scott-free. It is time for YOU to step to the plate and do what is right. Be. A. Mother. To the different "officials" who have had a hand in harassing my family to this day because you were ordered to do so at the threat of job safety and the safety of your family members, one day a knock will come at your doorstep asking to collect your soul and debts. Make sure you are prepared to pay them. To everyone who thinks me heartless on this day, please remember this. 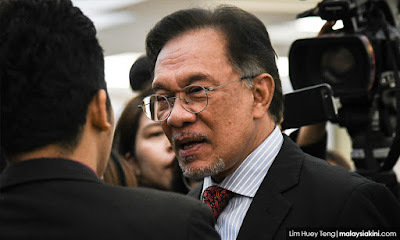 My prayers for truth and justice- just like any other Malaysian, has been answered this day and will continue to be answered. If Riza signed his soul to the devil to own what does not rightly belong to him, consider his debt with the devil collected and more due for collection. Similarly, all family members who have signed their soul to the devil... Your time will come. My price to pay to watch the house of cards come tumbling down and to be the voice of encouragement to everyone to never be afraid to stand up for what is right so that my husband, in laws and children can sleep soundly at night in peace and safety is to painfully watch my other family members that i left behind 10 years ago pay the price for their wrongdoings. Consider their debt as continuing to be paid. Ask yourselves: What about your debts? Have you ALL done the necessary debt payments due to yourselves, your country and its people? I will continue to pay mine so that we can all sleep soundly from tonight. Satu keberanian yang luar biasa walaupun dia telah mengalami satu ganguan yang dasat disebabkan tindakan seseorang ke atas dirinya..
Rasanya bila kita semua membaca nota ringkas di atas.. dapatlah diputuskan bahawanya si pengacau tersebut tidak lain dan tidak bukan.. jeng jeng jeng.. ibu kandung kepada Azrene itu sendiri..
Macam mana seorang ibu boleh tergamak memperlakukan anak dia dengan pelbagai jenis ugutan disebabkan anaknya tidak mahu hidup sebagaimana mereka hidup..
Dan ini sekaligus membuktikan cerita-cerita yang berlegar-legar di internet selama bertahun-tahun.. kononnya si mama kita telah melakukan pelbagai jenis ganguan dan halangan semata-mata mahu menghalang perhubungan dan perkahwinan anaknya dengan seseorang bahkan sampai tergamak menggunakan cara yang tidak sepatutnya..
Bila anak sendiri yang meluahkan perasaan.. takan kita taknak percaya pula..